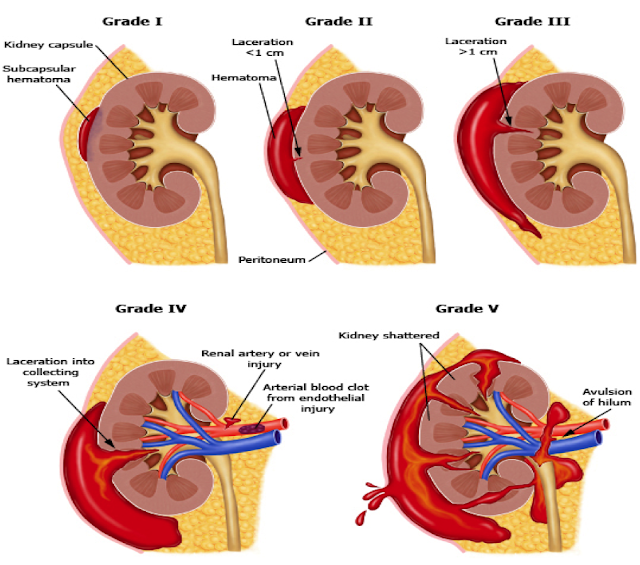 Which is the most common mode of renal injuries? Renal injury is common, occurring in 8–10% of polytrauma cases. About 90% of renal injuries result from blunt force injury and 10% from penetrating trauma. How good is USG for finding Renal injuries? A positive ultrasound is more likely to find higher grades of renal injury, but a negative renal ultrasound does not rule out renal injury. What is the gold standard investigation for Renal injuries? CECT Abdomen is the gold standard investigation for renal injuries. As a rule, all patients with penetrating flank and back trauma should have a CT examination. What are the indication of CECT if there is suspision of renal trauma? What are the situation where CECT will not be done? What is AAST grading for Renal Injuries? How to manage Renal injuries? What is the non operative management of renal injuries? Preferred for majority of stable patient with Renal injury Grade 1-4. What is the Operative Management of renal injuries? Retroperitoneal drain placement: The authors prefer to use a Penrose drain. Unless drainage is excessive, the Penrose drain is removed after 48 hours. Additionally, the urinary tract injury and the pancreatic injury are always drained separately. When primary vascular control is not achieved and massive bleeding is encountered, in the rush to control bleeding, a kidney that could have been salvaged may be unnecessarily sacrificed. Nephrectomy is required when the patient is persistently hemodynamically unstable despite initial measures and, thus, is a life-saving maneuver.